The Abergelle is a Nilotic Sanga found mainly in the Tanqua Abergelle and Seharti Samre districts of the Tigray region of North Ethiopia. The Abergelle is one of the smallest cattle breeds in the region and lives on plains and in river valleys at an altitude ranging between 1,300 – 1,550 meters (4,265 – 4,921 feet). Besides being very tolerant to heat stress, diseases and parasites, they also cope well with feed shortages during long dry periods. Abergelle are tick resistant with smooth coats. 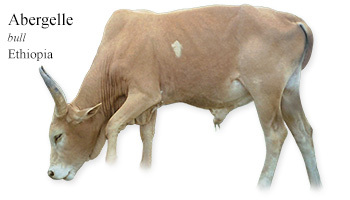 Males are taller and heavier and resemble the zebu type more although the hump is small and not very well developed. Females tend to resemble the sanga type. The Abergelle is locally highly rated for the quality of their hide and meat, and also their milk fat percentage. The Nilotic Sanga cattle group (also called Southern Sudanese, Sudanese Longhorn) consists of five major populations — with each being kept by a different Nilotic tribe in southern Sudan and southwest Ethiopia. My Daily Cow® Ethiopia and read about other Ethiopian cattle breeds.